One of the great things about Primoprint is that we are a one-stop shop. Just about everything you may need can be designed and ordered from the same place. One of the benefits is that your marketing materials can be designed to match your brand. Each piece can be printed on the same paper stocks with the same color values, and you don’t have to jump from company to company when trying to figure out what to order from where. We work very hard to make sure all your needs are answered and that the ordering process is as quick and easy as possible. We took an effortless, classic look for each item, and all of their pieces were printed on linen, except for the folder which we printed on matte. When completed, everything matched wonderfully. Each piece coordinated so well together as they all had the same color values and textures. Now, when Newport Asia sends material to customers, they will feel like they have a complete brand. It’s incredible how having these simple items can elevate the appeal and sophistication of a business. 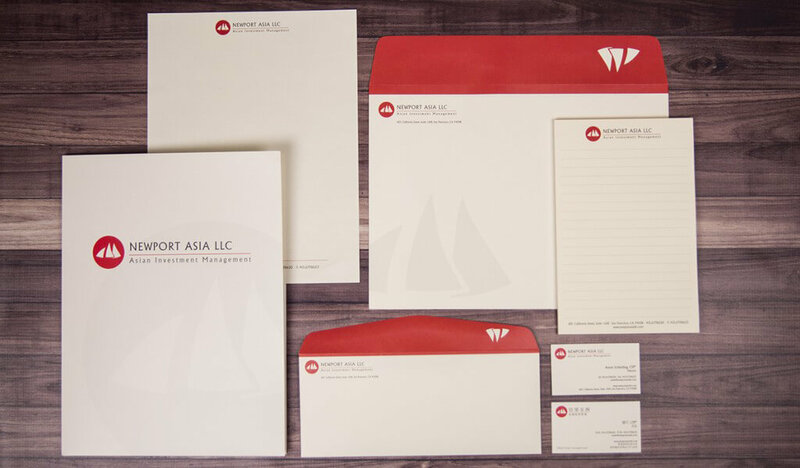 It was very nice working with Newport Asia, and I look forward to designing for them again in the future. Do you need help creating your marketing and presentation pieces? We would love to help. If your company is brand new without a previously branded look, or if you’ve been around for years with an established brand, we can create whatever you may need. To get started, just fill out the design contact form. Let us know what you’re looking for, and we will get back to you shortly with details on how to get started. We look forward to working with you!